On this day, the Sun in Virgo forms a trine with Pluto in Capricorn – keep an open heart and mind, because you might be sharing and/or receiving some rather surprising (and hitherto secret) information. With the Full Moon in emotionally-charged Pisces barely past, we might be getting all stuck in our feelings for a while – but remember not to be too hard on yourself. 9 September 2017 is a Universal Number 1 day, but also a Personal Number 9 day (it’s even a double nine!). These apparently contradictory energies of new beginnings (Number 1) and closures (Number 9) might disorientate the more energetically sensitive amongst us. But trust the Universe on this. 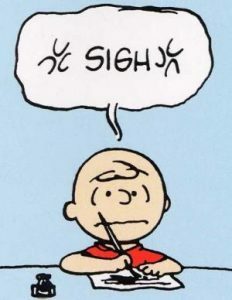 The lesson we might have to learn is detachment – removing our egos from our attachment to certain outcomes, and thereby relieving ourselves of suffering when these outcomes do not come to pass. The juxtaposition of Number 1 and Number 9 energies on this day reminds us to have faith that whenever one door shuts, another opens. The lesson we might have to learn is detachment… and don’t be too hard on yourself. 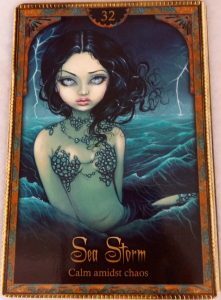 Our Weekend Oracle card is Sea Storm: Calm amidst chaos. Observe the girl in this Oracle card carefully – she’s not a mermaid like last week’s Oracle was, she’s a human being with legs, and the sea is definitely not her native element. Yet her eyes are filled with a quiet focus – not fear. She is determined to find a way out, and to overcome. Like her, you may be surrounded by a lot of emotional ups and downs at this time (the element of Water represents emotions in the Tarot and many Oracle deck traditions). The transformation you’re going through is massive, and if you get distracted by what you see around you, you’ll be pulled under by all that drama. Don’t look around – look inward. Find your own emotional ballast in the midst of the storm. Trust and follow the compass of your inner wisdom. You are stronger, smarter, braver, and more adaptable than you know. Don’t give up. You are going to be okay. Love and prayers to everyone out there going through emotional as well as literal storms in their lives right now – all over the world. May the Angels watch over us all.